When you look at the back of seed packets you’ll see a map of the US (if you live in the US) with colors on it; those are USDA gardening zones. Each zone represents a certain average low temperature for that area and are 10 degrees apart. I live along the Texas Gulf Coast which is a zone 9 (zone 9a to be exact). That means that the average low temperatures in my area are 20-30 degrees Fahrenheit. You can find your zone by typing in your zip code in this map. Although gardening zones (often called hardiness zones) focus on the cold temperatures, there are some other things you can glean from them and often gardeners will use them as a way of communicating what kind of climate they have. Knowing your gardening zone is a good place to start. But they don’t tell the whole story. A gardening zone 9 along the California coast is similar to a gardening zone 9 along the Texas coast in the winter, but not during the summers. Santa Cruz has an average August high temperature of 76°F, while our city along the Texas Gulf Coast has a average August high temperature of 95°F – that’s a big difference! This is why it’s super important to really learn about your climate and not just rely on knowing what your gardening zone is. If you need help understanding your climate we have a wonderful short course to help you out. You can learn more about the Understanding Your Climate course here. 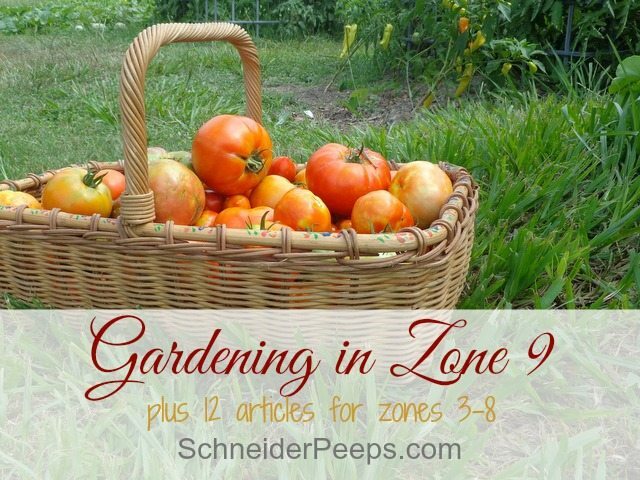 In a moment, I’m going to share with you some tips for gardening in zone 9. But first let me tell you about a tip that is good for any gardening zone. Write-things-down. Keeping track of what you planted and when, what you learned, which varieties did well and which ones didn’t will help you immensely. I know you think you’ll remember, but really, there’s just too much good gardening stuff and you won’t. The Gardening Notebook a great tool to help you create a custom notebook for your garden. If you don’t live in a zone 9 area, I have list of similar posts for your area written by some of my blogging friends who live all over the US and Canada. So, if you want to skip on down to the end of the post and find your zone, feel free to do so. Know that you will plant your spring garden earlier and your fall garden later than most people online. It’s okay. If you read a lot of gardening blogs, don’t get discouraged when everyone is putting in their fall gardens in late July and your garden is all burned up. I share my photos of my burned up garden in July and August so you will know you aren’t alone. Your fall garden will be put in in late September or early October and will grow all winter long. Don’t fall into the trap of believing that just because you have 8 or nine months between frost dates that you have an 8 or 9 month growing season. You probably don’t. Most plants (even heat loving ones) can’t take temperatures that reach the high 90’s or 100’s day after day. That means don’t dilly dally around when it comes time to plant your spring garden. I know no one else is planting outside in early to mid March (remember tip number 1) but you need to. Nothing but peppers and okra will produce in August and much of September. Either rip out the plants you do have that are barely surviving or keep them watered and they might start producing again when the temperatures come down. We usually start cleaning up our beds but I do leave the healthiest cherry tomato plant for the fall. You can also try covering your plants with shade cloth. We’ve not done this but it’s on the list to try. There is no winter break in zone 9. In some zones you put in your spring/summer garden and you harvest your spring/summer garden, then you put in your fall garden and you harvest your fall garden then you take a winter break. In a zone 9 garden that has a hot summer, your break (kind of) is in the heat of the summer when very few things are growing. Of course, you can take a winter break but honestly, winter is the best time to garden in most zone 9 gardens. 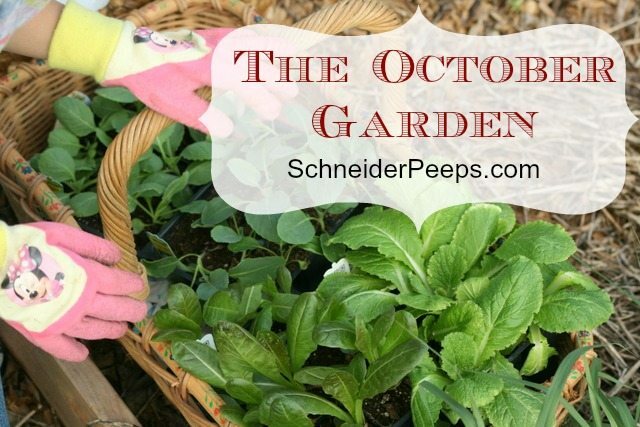 It’s cooler, there are fewer pests, and there isn’t the rush to preserve everything since most of the winter garden is greens and brassicas. If you’re trying to grow most of what your family eats, do you know how much you need to plant? I have some printable worksheets to help you out. Just fill out the form below and they’ll be emailed to you. January – If you planted a fall garden you should be enjoying all kinds of greens, carrots, broccoli and cauliflower from your garden this month. You might need to sow some more lettuce seeds or carrot seeds. You can also start seeds later this month. This is the time to make sure all your garden area that wasn’t used for a fall garden is ready for the spring. Layout your spring garden on paper, knowing that crops such as kale and swiss chard will still be producing into summer so use those beds last. If you didn’t plant onions in the fall, you can buy transplants and plant them this month. February – If you are going to start seeds inside and didn’t in January, you need to as soon as possible. Your average last frost date is probably sometime this month. You don’t need to plant right away but you need to be ready to plant in early March. You can probably go ahead and sow pea and bean seeds outside this month. You can also plant potatoes this month. March – This is the month to get most of your seeds and transplants in for the spring and summer garden. Plant summer squash, tomatoes, more beans (to keep extend the harvest season), beets,melons etc. I like to succession plant some things like our summer squash. 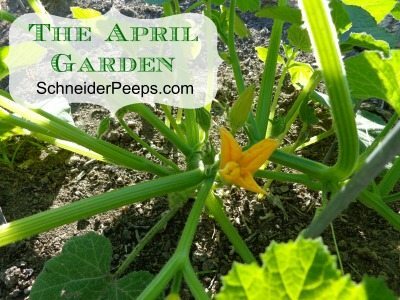 April – Early this month plant sweet potatoes, okra and winter squash. All the winter crops, except kale and swiss chard, have probably all bolted by now so clean out these beds and use them. You might also sow a few more summer squash seeds to extend the harvest. May – Keep everything watered and weeded. You will probably pick your first summer squash, beans and tomato this month. 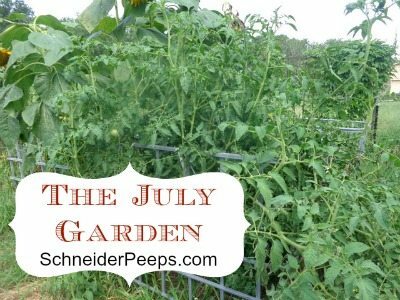 June – The tomatoes, summer squash and beans should really be coming in this month. Towards the end of this month is when you will probably begin to feel overwhelmed by the heat, the pests and the harvest. July – It’s getting hot so make sure you are watering a lot. The harvest should still be coming in quite a lot at the beginning of the month. 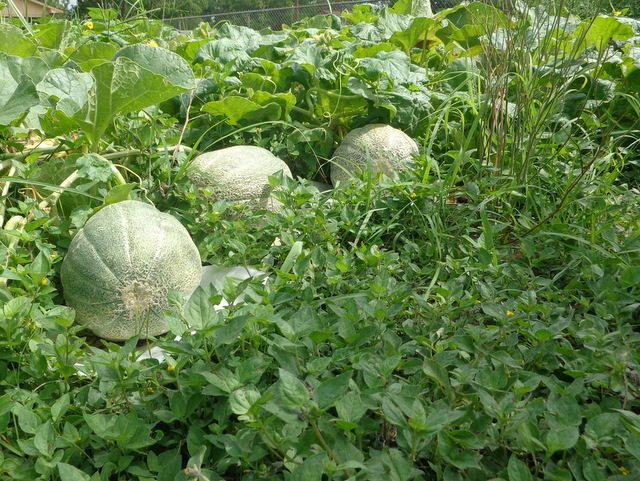 The melons should start ripening now. This is the time to think about using shade cloth to cover some of your plants. Many tomatoes will get sun scorched in the heat. Your winter squashes will probably be ready by the end of the month. The onions should be ready this month. As you clear areas of your garden out, consider sowing buckwheat as a green manure or to feed the bees. August – It’s mainly peppers and okra this month. You’ll get a few random tomatoes but mostly the plants are struggling to survive. Same with the summer squash. You can decided to just pull it all up or try to keep things watered enough to make it to fall. Either way is fine – it’s hot and you deserve a break. If you pull up things up, consider sowing buckwheat in it’s place. This is a great time to make notes in your gardening notebook. September – By mid month it should start cooling down. You can start some seeds indoors or wait a few more weeks to sow them outside. You should still be harvesting peppers and okra this month. You can probably harvest your sweet potatoes now. Towards the end of the month you can plant some tomato transplants for the winter (I like to do cherry type tomatoes because they ripen quicker). October – Now’s the time to sow your fall garden- lettuce, kale, chard, broccoli, beets and cauliflower are all things I plant this month. I try to wait until we’re going to have rain for 2-3 days and sow seeds the day before. We can still have hot days in October so make sure you water regularly. November – You should be harvesting lettuce and other baby greens by the end of the month. If you are going to plant onions and garlic for next summer now is the time. I really like starting onions by seeds. I just sprinkle them in a line and let them grow all bunched together and in February dig them up and transplant them. Depending on the winter you might be able to keep your tomato plants going, just be sure to cover them if you dip below freezing. You should not have to cover any of your cold weather crops unless you dip into the low 20s. December – You should be able to harvest greens and maybe even some broccoli and cauliflower towards the end of the month. 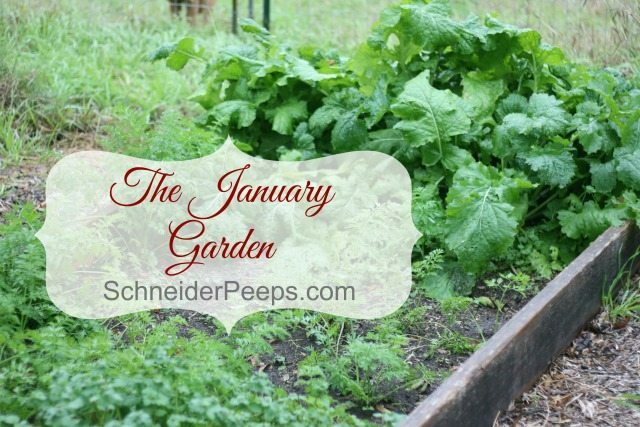 Cool temperatures and almost no pests make winter gardening in zone 9 super enjoyable. 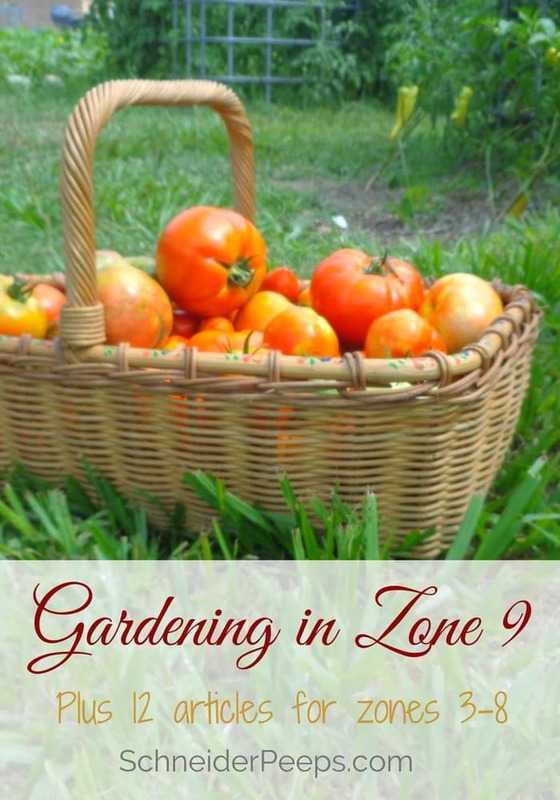 I’m sure I’ve forgotten something, so if you garden in zone 9 what are your tips? Thank you SO much for this! I have a hard time finding any sort of timeline for our region (I’m in Southern Louisiana, about 45 minutes from the Gulf) and am really starting planting this year. Wasn’t sure when to start! Thank you! I am turning this info into a chart to put by my potting bench for reference! You’re welcome. I’m glad it’s useful for you! Thank you so much for this infomation, I am going to try raised beds for the first time and this chart will help me. You’re welcome. I think you’ll like raised beds, they are much easier to manage in my opinion. I recently came across 1 other zone 9 gardening site – http://www.Thepapershell.com. As zone 9 sites seem to be in short supply just thought I’d mention it. Well written, lots of good, accurate info. Thanks for sharing! I’m headed to check out the site now. Out of curiosity, is this site still operating? I’m getting an error message when I try using the link; same error message if I just type in the site and search?! I’ll definitely be checking back to your site and gearing up for a major planting spree in March! Hello there, thank you so much for sharing such detailed information, and in layman’s terms no less, you are a Godsend!! I live in Southeastern California (along the CA/AZ border) & I wish I had come across this before I decided to start my very first garden (ever) last year; I planted cukes, tomatoes, peppers, bush beans, and broccoli… in late April ?. The peppers were going strong until some of the stray kittens found my little jungle of a garden bed, which is why I had my husband build a frame around my garden beds using chicken wire. Cukes did okay, not awesome, but I wasn’t disappointed. Unfortunately, as for the tomatoes, their failure is only partially due to the high heat of the summer, what did them in was my ignorance on the subject of watering frequency and depth, as well as overhead watering; the tomatoes that did form were all severely cat faced. As you can guess, the broccoli faired the worst; within a month of planting, I had these wonderfully healthy looking broccoli plants, with these gigantic leaves (some got to be a foot & a half wide), but no heads… it was mid June before two heads finally formed, but were only about the size of a quarter when they bolted ?. My only success story, and probably the only thing that kept me from becoming completely discouraged with gardening altogether, were the bush beans. All beginning gardeners should plant some bush beans, they are the best confidence boosters imaginable; they are low maintenance, fast producing, and best of all, they are high in nitrogen, which helps to build strong, fertile soil!! research and planning for this years garden. It’s the beginning of June and, rather than depleting my linen supply, feverishly trying to protect my plants from the blazing sun with white sheets, in the past two weeks I’ve harvested a full basket of bell peppers, a full basket of tomatoes, almost two baskets of cukes, and to my complete surprise and utter disbelief, yesterday (June 5th ?) I harvested my first pumpkin. I am now, and will forever be, addicted to gardening!! Sorry I got off on a tangent, I started this comment in an effort to give you some info about me, so that you’ll have a better chance at hopefully answering my question. I love sweet corn. During my research for this years garden, I kept running into sites and articles that stated sweet corn grows best in hardiness zones 4-8. I understand that hardiness zones are there to help give gardeners a general idea of what plants will have a higher rate of success, rather than etched in stone and inflexible. The reason this bugged me is because I’ve lived in this area for over 15 years, and while it’s never been as tall as the giant stalks I am used to seeing while growing up in Missouri, corn is grown here. So I threw caution to the wind and grew some corn – 16 plants in a 4×4 raised bed and then 8 in a planter I situated directly beside that bed (since it’s pollinated by wind); in an effort to get a jumpstart on them, Despite the many sites that were advising gardeners to directly sow corn, rather than transplanting, in an effort to get a jumpstart on the season (and because, even after all of my research, I didn’t know that corn grows fast. Very fast! ), I started indoors using peat pots. With an extremely gentle hand and lots of patience, I only lost two plants shortly after transplanting. Transplanting took place the last week in March, tasseling began about three weeks ago, with silks emerging a little more than a week later. So, to get to my long awaited question: Physiologically speaking (since most sites give a recommended harvest date as late summer – no help), how can I tell if the ears are ripe. Silks have started turning different shades of brown, and the ones with the darker brown silks, feel solid when I squeeze, which seems like that would indicate ripeness. Several sites advise slightly peeling open the husk and piercing a kernel to check the juice that drains out, but they also caution about opening the husks prior to maturity since it raises the risk of invading insects gaining access. After already battling an early infestation of aphids and ants, I’m loathe to do anything that might invite them to come back and try again, so I’m looking for another sign, if there is one, that indicates ripeness (I don’t want to miss the small window of opportunity of harvesting it before the sugar turns to starch). Any advice on the subject, or even pointing me in the direction of someone who knows, would be extremely appreciated!! Thank you again for sharing!! Hi Betty, I’m so glad you stopped by and chatted with me and that you didn’t give up after last year. We grow sweet corn all the time. Of course, we have to plant earlier and harvest earlier than most of the country. We harvest when the tassels have turned brown (but before they are totally dried and brown) and when the tip of the ear feels full. So, your instincts are right on. We usually harvest just one or two and taste them before harvesting the others. Gardening is as much an art as it is a science. Let me know how they turn out! Thanks so much for your swift reply. Just got done working a graveyard shift & heading out to tend to my garden; about the time I start getting sleepy is about the same time that the rising temps force everybody inside anyway, win-win situation. Sounds like harvesting corn will be my morning task, I will be sure to let you know how it goes!! How did you harvest pumpkin?! My pumpkin plant looks terrible. I see no pests, except nasty baby cockroaches i believe ? Gross! I had some pumpkins flowered in July but the got burned up very fast, so I covered with a gardening tarp and I’m were I am now. I’m worried old won’t be able to harvest a pumpkin. I harvest when the pumpkins are orange and plant is starting to die back. I also put a piece of cardboard under the pumpkins to keep them up off the ground to keep the bugs off the bottoms of them. You might find this article helpful, http://www.schneiderpeeps.com/in-the-garden-pumpkins-and-winter-squash/. Let me know how it goes. Thank you. Mine didn’t grow bigger then the size of a ping pong ball, very beginning before the sun scorched them, so we put the cover over them, and now it isn’t producing flowers. I may try to start another one and see how that one goes. Maybe I’ll have a pumpkin oct or November. This is my first year gardening so it’s all trial and error.? Thank you for the link as well! I definitely will keep in mind putting cardboard under it, also with my cantaloupe. I harvested one and it got attracted by ants. Hello there!! I really appreciate all the information you have posted. I would like to know when do you plant your corn? Also, do you plant the seed directly outside or do you start it indoors first? Have you tried the “three sisters planting” which is corn, pole beans and squash? Hi Suzie, we plant corn in our area at the beginning of March. It’s one of the first summer crops that goes in. Corn does not transplant well, so just direct seed it. I have tried the three sisters planting, you’ll just want to be sure and let your corn get a bit of a head start. So don’t try to plant all three at the same time. I am in Southern California, my zone is 9a as well. My tomato plants burned up in July. I did get a cover, but wasn’t able to save it. My cantaloupe is doing well, pumpkin is iffy. It’s looking a little sad. Not sure what I’m doing wrong but trying to save it. Beginning of July I had some pumpkins appearing, but it burned up before I got to covering ?. My zucchini plant is doing well. I have only been able to harvest a few good sized ones. I planted in March and it’s still going. A lot of the zucchinis have been no bigger then a pinky finger to a ring finger. My herbs are doing well, sweet basil and rosemary. My dill is gone, lemon balm barely surviving. Rosemary and basil are doing well. My lavender look dried, no flowers. I figure it’s the ending period for it? I do have broccoli. I planted it in March from seed, it had said that on package to plant March, I’m shocked it’s still living since it’s a cooler temp plant. It’s been getting to 115 ?? any suggestions would be appreciated! I wonder if your zucchini isn’t getting pollinated? There are female blooms (those with a little fruit at the base) and male blooms (those without a fruit). You can use an artist brush and gather pollen from a male bloom and brush it in the female blooms. Hopefully, that will give you some nice size zucchini. I’m shocked about the broccoli too, but that’s pretty cool. You can replant the dill in the fall, you should also plant cilantro in the fall if your going to grow it. The fall/winter garden is really great in zone 9. I have tried that trick pollinating myself. I just used my finger, artist brush is a great idea!!!!! Fall garden I’m going to get lots of flowers to attract bees, because I haven’t seen many at all! I had put my hummingbird feeder out because they take over it, but it leaked so I took it down ? What flowers do you suggest to attract bees for our zone? Really any herbs or wildflowers. Our bees really like our salvia, mexican heather, crepe mertle and bottle brush bushes. You can also set up a bee watering station, http://countrysidenetwork.com/daily/lifestyle/beekeeping/how-to-make-a-bee-watering-station/, on your property. Bees really like single bloom flowers so showy things like modern hibiscus are not going to be as useful to them. I’m thrilled to find a blogger who not only is gardening in zone 9 like me but is also doing so just a short drive up the coastline from me! Some things here are started a week or two sooner than with you, but it’s very close. My farm girl genes are stifled here on our small city lot, but I’ve eeked out some space after filling in a swimming pool and creating a couple of flowerbeds and three small raised beds. Oh what mischief I could get into on a lot the size of your acre and a half! This post is a great timetable for veggie gardening, the most intriguing being the mention of pumpkins! I wasn’t sure when I should plant them here, or if they would even work. Now I’m adding them to my list of what to add next year. I’m now looking forward to getting your posts via email. Hey, neighbor! It’s so fun to meet people who understand that gardening in our area is quite different that the rest of the internet. I often feel along in my plantings and harvesting. Let me know how the pumpkins work out for you. We are so thankful for our small acreage and hope that one day it is a fruit and vegetable mini-farm that we can share with our family, friends and community. Thanks so much for subscribing to our emails. This was the most amazing article I’ve read on gardening in my zone and who I needed to know what zone I was gardening in. Thank you. I’m glad you found the article helpful, Ericka! I’ve been looking for a zone 9 blog for 2 years. So glad I found you. Hi Michelle, so glad you found us! I hope the gardening posts help you out. Really great post. You wrote an article according to the zone which is a good thing. Thanks. Thanks for the great information. I just started a garden this year on the side of my house. It is the only part of the yard that gets any sun. The rest is shaded with mature trees most of the day. My home is in Northern California in Zone 9b. It was hard to find plants in mid July to plant, but managed to find a few pepper plants and transplanted a tomato I started in March (unfortunately it didn’t do much as the weather was mostly mid 50’s and overcast until June), also planted some corn that seems to be doing great. I’ve seen the farmers not to far away in the Central Valley plant 2 or 3 crops of corn in a season so figured it wasn’t too late to start that from seed. So far so good. I’ll be ready this fall to plant some good greens and broccoli.